R/C Toy Memories The nostalgia website for vintage radio controlled cars & other toys, from Tamiya, Nikko, Kyosho, Tyco, Taiyo, Radio Shack, Shinsei, AYK, Marui, Tomy, and many more. 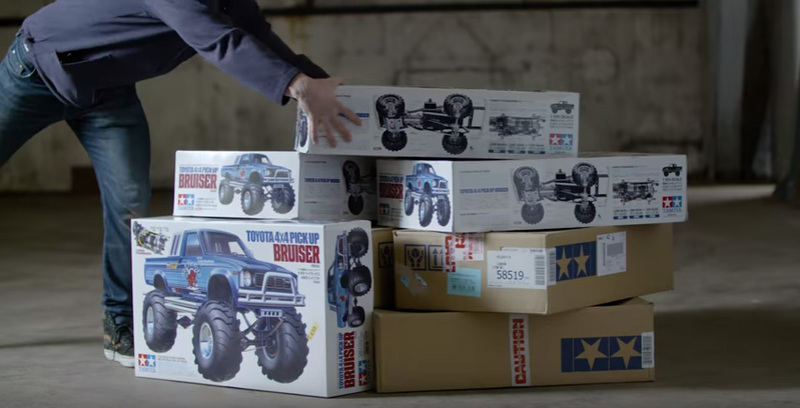 To promote the new Toyota Hilux, Toyota UK have recently released a series of short videos featuring one of Tamiya’s famous R/C hiluxes – the Toyota 4×4 Pickup Bruiser. Tamiya’s Toyota 4×4 Pickup Bruiser was first released back in 1985, and the huge and heavy original kit from the 1980s remains a holy grail for many R/C collectors. In 2012, Tamiya produced a remake of the Bruiser which differed from the original, but nonetheless brought the retro style of the model back into model stores once more. Yes, that image confirms it 🙂 A whole stack of the remake kits (nobody was game enough to use the vintage original model). The Toyota promotion itself seems to have captured some mainstream coverage from the media as well, being picked up over the past couple of weeks by Autoweek, Motor Trend, The Mirror, and no doubt every other car website. Awesome 🙂 Thanks for sharing Nidan!